PDXpert software assists compliance with U.S. Food and Drug Administration regulation 21 CFR Part 820 - Quality System Regulation (1 April 2003). §820.20 ...Each manufacturer shall establish quality system procedures and instructions. Create and manage procedures and instructions using PDXpert document types, revision management and change workflow. A separate QSR-related change form can reflect the unique approval requirements of your quality documents. §820.25(b) Training. ... Training shall be documented. Training documents can be created and managed using PDXpert document types, revision management and change workflow. §820.30(b) Design and development planning. Each manufacturer shall establish and maintain plans that ... shall be reviewed, updated, and approved as design and development evolves. Design and development plans, like other documents, can be managed through the revision control, review and release process provided by PDXpert change workflow. §820.30(c) Design input. ... The design input requirements shall be documented and shall be reviewed and approved by a designated individual(s). ... Requirement documents are approved using a flexible change workflow that ensures proper review and approval by an authorized representative of each requirement function. §820.30(d) Design output. ... Design output shall be documented, reviewed, and approved before release. The approval, including the date and signature of the individual(s) approving the output, shall be documented. Design documents are approved using a flexible change workflow that ensures proper review and approval by an authorized representative of each design function. §820.30(e) Design review. ... The results of a design review, including identification of the design, the date, and the individual(s) performing the review, shall be documented in the design history file (the DHF). Design review minutes, like other documents, can be managed using the PDXpert change workflow to ensure that all participants review and approve the document. §820.30(h) Design transfer. Each manufacturer shall ... ensure that the device design is correctly translated into production specifications. Specialized change forms can be defined to control production specifications, work instructions and inspection procedures. Workflows and approval lists may include procurement, production, quality, service and other affected managers. §820.30(i) Design changes. Each manufacturer shall establish and maintain procedures for the identification, documentation, validation or where appropriate verification, review, and approval of design changes before their implementation. A complete Affected Items list on each change form allows reviewers to "drill down" into each item, and examine revisions in terms of production attributes, document and part relations, electronic file attachments, and other attributes. Impact assessment may include multiple dispositioning instructions for each affected item. §820.30(j) Design history file. Each manufacturer shall establish and maintain a DHF for each type of device. The DHF shall contain or reference the records necessary to demonstrate that the design was developed in accordance with the approved design plan and the requirements of this part. 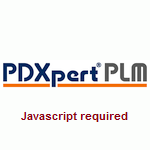 The PDXpert product structure can directly reference functional and performance requirements. Verification and validation records can be separately maintained, or electronic files can be directly attached to the items that they support. §820.40(a) Document approval and distribution. Each manufacturer shall designate an individual(s) to review for adequacy and approve prior to issuance all documents established to meet the requirements of this part. The approval, including the date and signature of the individual(s) approving the document, shall be documented. Documents established to meet the requirements of this part shall be available at all locations for which they are designated, used, or otherwise necessary, and all obsolete documents shall be promptly removed from all points of use or otherwise prevented from unintended use. Any number of reviewing departments, each with designated reviewers, can be assigned to a change workflow. Each reviewer's response consists of the (1) administrator-assigned reviewer name, (2) system-assigned date/time of the review, and (3) reviewer-selected response (approve, disapprove, hold, etc.) to the proposed change. The implementing change form permits assignment and closure of document dispositioning tasks, such as delivery of new released revisions and destruction of canceled revisions. §820.40(b) Document changes. Changes to documents shall be reviewed and approved by an individual(s) in the same function or organization that performed the original review and approval, unless specifically designated otherwise. Approved changes shall be communicated to the appropriate personnel in a timely manner. Each manufacturer shall maintain records of changes to documents. Change records shall include a description of the change, identification of the affected documents, the signature of the approving individual(s), the approval date, and when the change becomes effective. Document changes can be handled using the same change workflow as the initial approval and release. In addition, distinct "Initial Release" and "Change Notice" forms may be defined to accommodate, for example, different approver lists based on differences in financial or technical impact based on an items lifecycle phase. Change forms include a primary discussion area and optional secondary discussion, each with administrator-defined labels and text templates to ensure complete and consistent user change descriptions. §820.50(a)(3) Establish and maintain records of acceptable suppliers, contractors, and consultants. Each item in PDXpert has a Source list that allows one or more qualified supplier items to be identified, ranked and controlled. Source items include the full set of item attributes including supplier, item number, revision, lifecycle phase, materials, cost & ordering attributes, and specification files. §820.70(a) General. ... Where process controls are needed they shall include: (1) Documented instructions, standard operating procedures (SOPs), and methods that define and control the manner of production; ... (3) Compliance with specified reference standards or codes; ... (5) Criteria for workmanship which shall be expressed in documented standards.... Specialized change forms can be defined with their own workflows and approval lists to control documented production procedures and methods. Reference standards and codes, as well as workmanship criteria and inspection procedures, can be directly linked to the items they affect. §820.70(b) Production and process changes. Each manufacturer shall establish and maintain procedures for changes to a specification, method, process, or procedure. ... Changes shall be approved in accordance with §820.40. Changes to production and process documentation can be handled using the same change workflow as the initial approval and release, or using a differentiated approval process. §820.90(a) Control of nonconforming product. Each manufacturer shall establish and maintain procedures to control product that does not conform to specified requirements. The procedures shall address the identification, documentation, evaluation, segregation, and disposition of nonconforming product. The evaluation of nonconformance shall include a determination of the need for an investigation and notification of the persons or organizations responsible for the nonconformance. The evaluation and any investigation shall be documented. New change forms can be defined within PDXpert, including stop shipment notices, deviations and waivers, each with their own reviews, observers and workflow. §820.90(b) Nonconformity review and disposition. (1) Each manufacturer shall establish and maintain procedures that define the responsibility for review and the authority for the disposition of nonconforming product. The procedures shall set forth the review and disposition process. Disposition of nonconforming product shall be documented. Documentation shall include the justification for use of nonconforming product and the signature of the individual(s) authorizing the use. Affected parts listed on implementing change forms can include disposition instructions (with quantity, cost, current location, assignee, etc.) for rework, return to vendor, user as-is, and similar tasks. Dispositioning tasks can be assigned to an individual who can comment on and close the task. §820.100(a) ... (5) Implementing and recording changes in methods and procedures needed to correct and prevent identified quality problems; (6) Ensuring that information related to quality problems or nonconforming product is disseminated to those directly responsible for assuring the quality of such product or the prevention of such problems; ... All documents affecting the correction and prevention of quality problems can be recorded, reviewed and approved within PDXpert. Upon the release of these documents, the change workflow can notify via email those directly responsible for assuring product quality. §820.181 Device master record. ... The DMR for each type of device shall include, or refer to the location of, the following information: (a) Device specifications including appropriate drawings, composition, formulation, component specifications, and software specifications; (b) Production process specifications including the appropriate equipment specifications, production methods, production procedures, and production environment specifications; (c) Quality assurance procedures and specifications including acceptance criteria and the quality assurance equipment to be used; (d) Packaging and labeling specifications, including methods and processes used; and (e) Installation, maintenance, and servicing procedures and methods. In PDXpert, the product structure directly links all appropriate device specifications; product process specifications; quality assurance procedures and specifications; packaging and labeling specifications; installation, maintenance, and servicing procedures and methods; and any other relevant documentation. Each item on the structure is automatically updated to reflect the most current approved and released revision. §820.186 Quality system record. ... The QSR shall include, or refer to the location of, procedures and the documentation of activities required by this part that are not specific to a particular type of device(s), including, but not limited to, the records required by §820.20. Each manufacturer shall ensure that the QSR is prepared and approved in accordance with §820.40. General procedures required by this part that are not specific to a particular type of device may be documented and controlled as any other document or special document type(s) may be created to ensure these documents are created, reviewed and approved as part of the QSR data set.